ACCEPT is a Japanese Progressive Unit (not a German Heavy metal). Basically all instruments are played by one person. But it sounds like a band-playing. 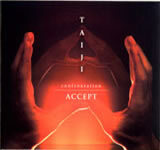 This album, “TAIJI -confrontation-“(2012) is a total concept album that consists of 14 tracks in about 60 minutes.